Huge Pet Adoption Event in Union Square Park on Sunday! More than 200 dogs and cats will be available from more than 30 rescue organizations. $25 microchipping for dogs and cats, dog licensing, and tips to help you prepare for emergencies. Representatives from the New York City Office of Emergency Management / Ready New York will be on hand to advise you! Special skateboarding performance by Wally from Animal Planet’s Who Let the Dogs Out, plus sessions for you and your dog with a certified dog trainer from Petco. Get free merchandise and information from our featured Adoptapalooza vendors, including Blue Buffalo, Freshpet, Merrick, Natural Balance, SafetyGlo, and Wellness. Rock & Rawhide will collect clean blankets, sheets, and pet toys to distribute to animal shelters. 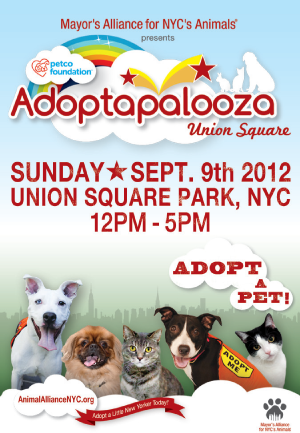 Enter the Adoptapalooza Union Square Sweepstakes! Enter for your chance to win a $200 Adoptapalooza Gift Card or $300 Gift Basket from Petco! Share your personal link with your friends and earn more chances to win.